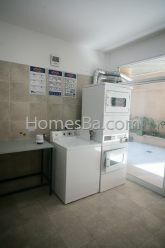 Beautiful and fully equipped studio, brand new building with widespread view. Bright, very well located apartment one block from the Alto Palermo shopping. It has quality furnishings and beautiful details. Comfortable apartment for a pleasant stay in Buenos Aires, altogether with modernity and comfort. The building has a Jacuzzi, laundry, reception, charcoal barbecue, garage (optional with extra charge). Weekly maid service included with change of towels and sheets . Included: Maid service, once a week, Wifi internet,LCD 32" TV cable. Deposit: One month rental :one month safety deposit. One week rental:one week deposit. The building has a Jacuzzi, laundry, reception, Barbecue, garage (optional extra charge). Maid service with change of towels and sheets once a week without charge.